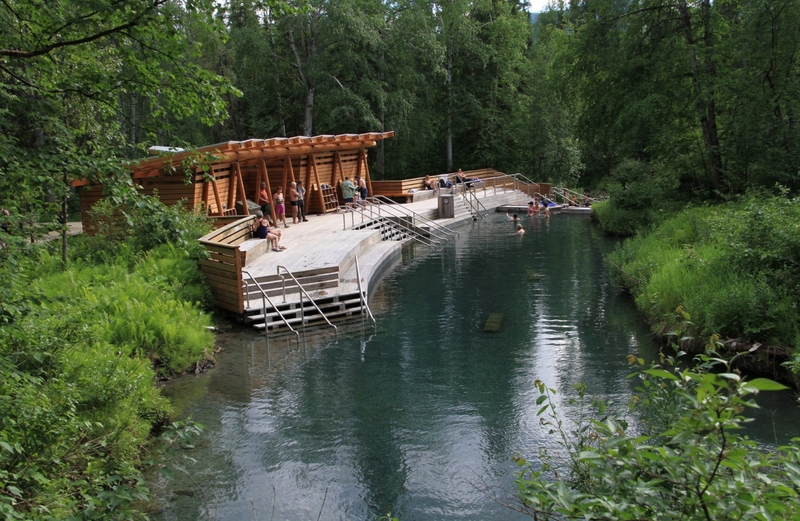 Among the most highly recommended stops along the Alaska Highway is the large natural pool at Liard River Hot Springs Provincial Park. But if your schedule allows for a longer stay, there is more here to discover. The 1,082-hectare (2,674-acre) park was established on April 26, 1957 to protect the second largest springs in Canada. But the rich history of the hot pools goes back centuries to First Nations use before the arrival of Europeans. The site later played a role in the fur trade, and it was a prominent location during the construction of the Alaska Highway in 1942-43. At one time, it was even home to a large laundry. 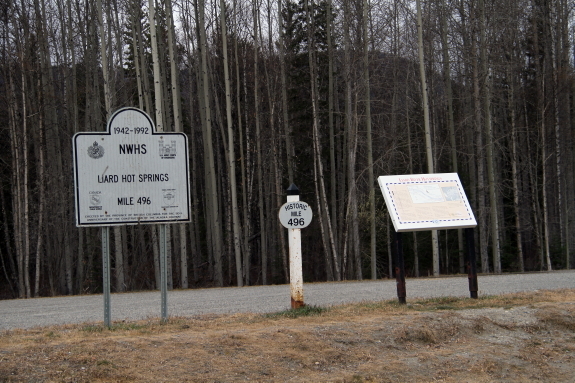 Interpretive signs mark Historic Mile 496 of the Alaska Highway and recount the highway’s construction through the area. There is also a map showing where U.S. Army facilities stood at that time. Little remains, but you can walk around a get a sense of the way things used to be. Interpretive signs describe the area and its history. 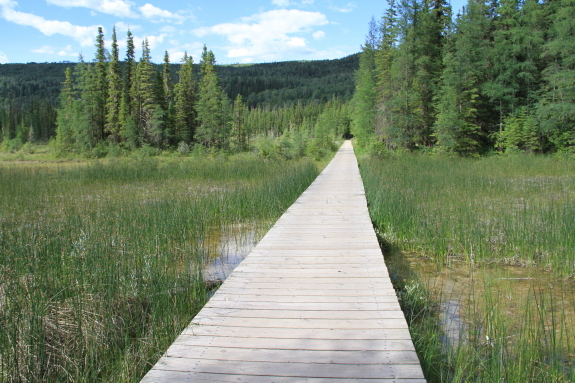 Access to the hot springs, known as Alpha Pool, is via a boardwalk that crosses a warm water swamp and goes through the boreal forest. Tiny fish (lake chub) can usually be seen in the swamp, and moose sightings are common. Boardwalk to the hot springs. Alpha Pool boasts a tropical look in the summers, when the area around the springs comes alive with ostrich ferns and unusually tall cow parsnip. Other thermally influenced species also thrive here. Alpha Pool in early July. A short walk past Alpha Pool takes you to the Hanging Gardens, where tufa (calcium deposits precipitated from the hot springs water) has formed a high, terraced wall that supports a wide variety of plant life. Water temperatures in Alpha Pool, which empties over a small waterfall, reportedly range from 42-52°C (108-126°F). More comfortable temperatures are found farther away from the source. There is a day-use charge in the summer when the gatehouse is open: $5 for adults, $3 for children or $10 for families. Annual passes are available at a rate of $10 for adults and $20 for families. Beta Pool, a 20-minute walk beyond Alpha, closed a few years ago and is no longer accessible, though many websites still report that it is. The park is open and bustling year round. The gatehouse at the entrance is closed in the off season. 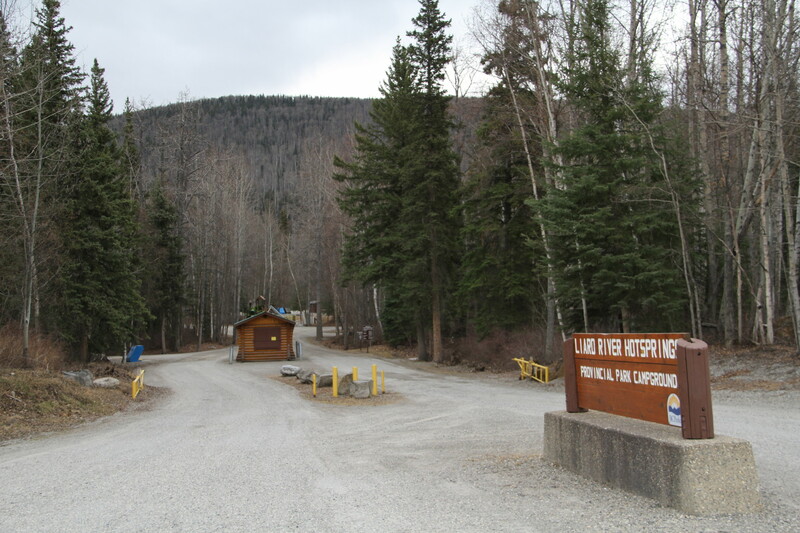 Entrance to the campground and hot springs. The off-season camping rate is $16 per night, and in the summer it’s $26 per night. The campground fills up very early each day during the summer, and can be busy any time of year. A marvelous adventure playground was installed last year. 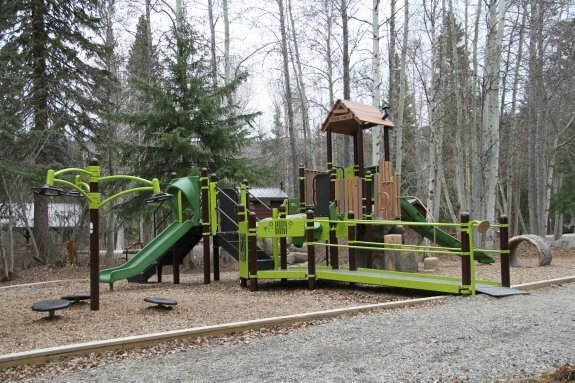 The newly installed children’s playground. Perhaps as famous as the hot springs is the area’s thriving population of wood bison. 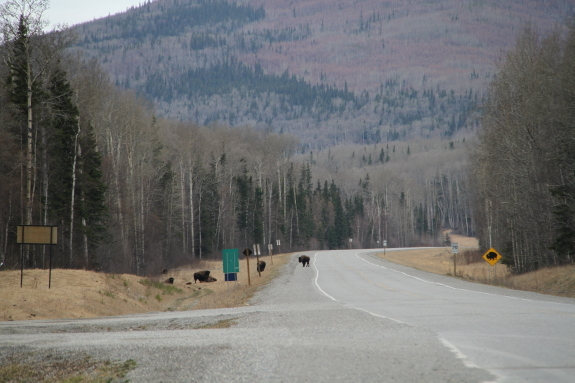 Members of two reintroduced herds are commonly seen along the stretch of road between Muncho Lake and the Yukon border. Bison at the entrance road to the hot springs. 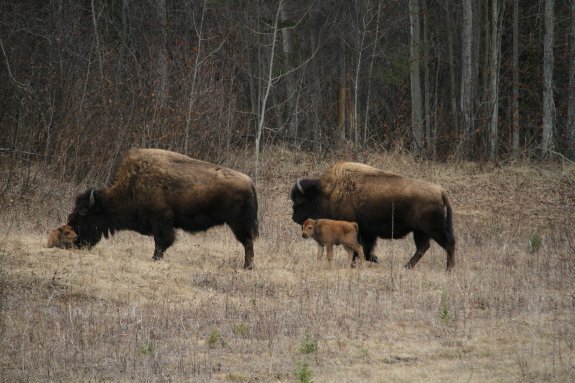 At the time of my visit, the bison had just started to drop their calves. Based on how unsteady they were on their feet, I guessed the two seen in the photo below (shot from my RV window) to be only a day or two old. One hundred meters or so outside the park boundary is the last remaining suspension bridge on the Alaska Highway. The Lower Liard River Bridge, 348 meters (1,143 feet) long, was built in 1943-44 during an upgrading of the highway that the army had pushed through. 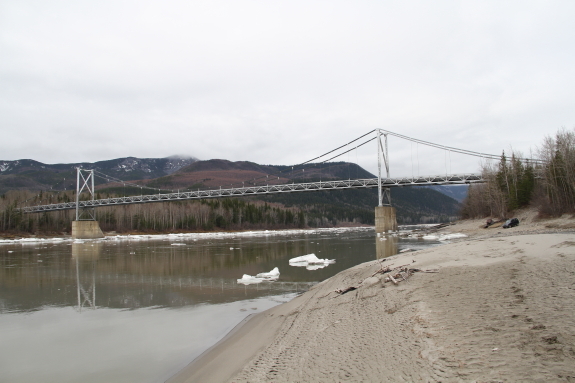 Suspension bridge spanning the Liard River. With a 4×4 you can get right down to the Liard River via a rough road at the north end of the bridge. Long stretches of fine-sand beach make this a wonderful place for kids and dogs to play. 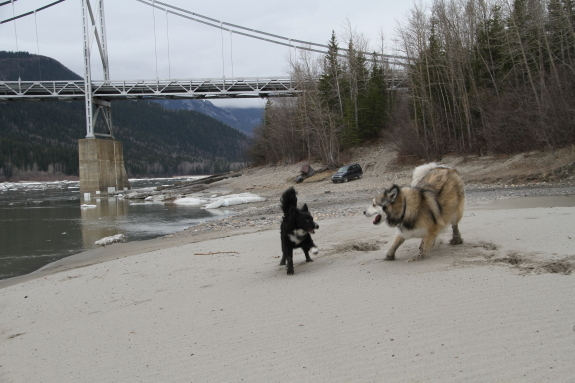 Dogs enjoying a romp in the sand. 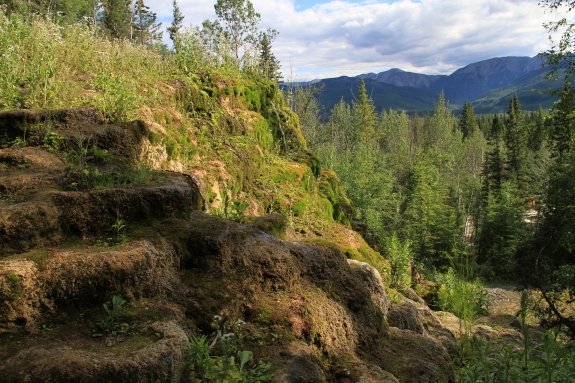 Access to the park is directly off the Alaska Highway, approximately 300 km (186 mi) northwest of Fort Nelson and 200 km (124 mi) southeast of Watson Lake in the Yukon. 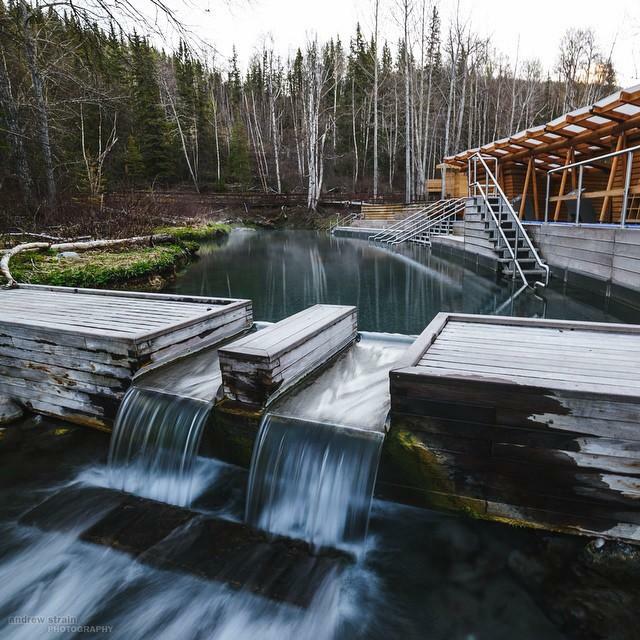 Across the highway is Liard Hot Springs Lodge, which offers rooms, meals and an RV park. Also across the highway is short-term parking and overflow camping.